It’s that time of the year when Amazon offers some of its best prices on new Kindle e-readers and Fire Tablets. The just released all new Kindle Paperwhite makes this season’s sales look especially appealing. Amazon’s Trade-in program makes it easy to make a few dollars and save money on an upgrade your device at the same time.All you have to do is select the model of your device, answer a few questions about condition, and you’re given an estimate of the trade-in value to accept or reject. They even give you a label and pick up the shipping costs to send it back to Amazon. When Amazon receives your item, it is checked for condition and the value of the trade-in is applied to your account as a gift card. The program does accept certain items that no longer work, hold a charge, or that have cracked screens. While the payout is very small for these items, an upgrade discount is generally included. Also, Amazon does pay for the shipping and it does get broken device out of the house. Amazon does the recycling and you score one for decluttering! While the first Kindle ereader was introduced in 2007, Amazon has released a new model or an upgrade every year since 2009. Many of the older models are either still around. You can now trade in your old e-ink ereader for Amazon credit and possibly get a hefty discount off the purchase of a new one. 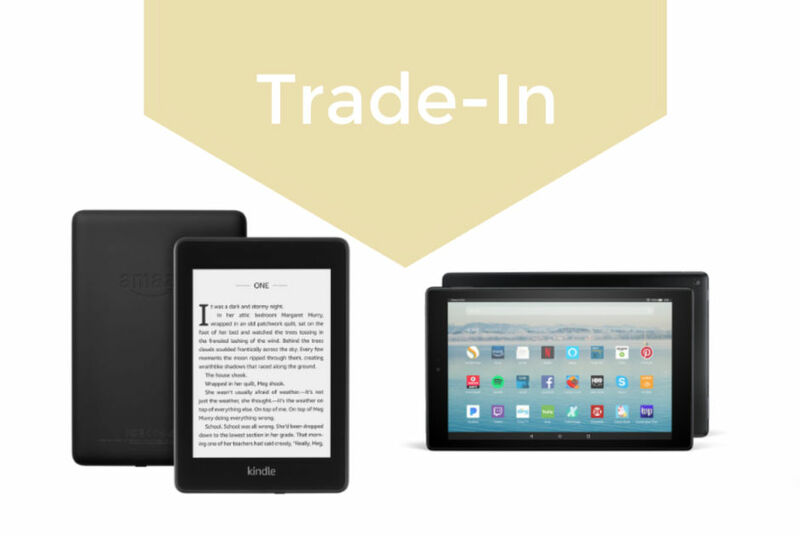 Currently, Amazon is accepting trade-ins on models ranging from the first generation Kindle up to the last year’s model of the Kindle Oasis. There is a section on the page to help you figure out your model if you are not sure what it is. Amazon seems to bring out new tablets with even more frequency than it does its e-ink readers. Because tablets have hardware limitations which can make updates difficult or even impossible as they age, all tablets have a certain built in obsolescence (and people ask the “how much is my Fire tablet worth?” question a lot). That makes the idea of trade-ins for Fire tablets even more welcome. Only certain tablet models are eligible for trade in, and many of the older models like the first generation Kindle Fire are not currently listed on the page. Want to trade-in another brand of tablet? Amazon also accepts trade-ins of Apple iPads and Samsung tablets. You can also trade in Roku, Apple TV, or Chromecast streaming media players. Interestingly, Amazon is not accepting trade-ins of its own Fire TV devices at this time. Amazon also has other trade-In categories, including textbooks, cell phones, video games, systems and controllers. One of the things that Amazon does to make it easier to trade in items you no longer need is located on the main Trade-in page. Amazon shows you a list of items you have purchased that are currently eligible for trade in. Trade-In eligible items also have a yellow Trade-In button on the product pages. Amounts for items in trade-in offers does change and sometimes certain device models are not eligible for trade-in. Check the trade-in page for the most up to date trade in values and discount offers. It is important to realize that you are not going to get the maximum value for your items through Amazon’s trade-in program. Depending on the item and its condition, you may be better off selling it through eBay, Craigslist or other online trade-in programs. What Amazon does offer is a quick, easy way to get rid of items that is ideal for someone planning on updating to a new Amazon product. Payment is a gift card or credit to your Amazon account and many trade-ins also include a generous upgrade discount. But to be on the safe side, here’s a pro tip for online trade-in on any site: Make a note of the model and serial numbers of the device you are trading in. Take pictures to document the device’s condition. Don’t send boxes and other accessory items unless these are requested as part of the trade-in. The bottom line: If getting the most bucks for your item is your priority, the Amazon trade-in programs is not your best choice. However, if you are looking to upgrade or your device is DOA or doesn’t have a lot of value of the secondary market, an Amazon trade-in can be a win. Amazon is releasing a new update for its Freetime Unlimited service that adds over a thousand kid-friendly audiobooks to its collection of apps, games and videos for children.. Available books will include classics like Peter Pan, Rip Van Winkle, Beauty and the Beast and more. The books will be delivered via a software update. 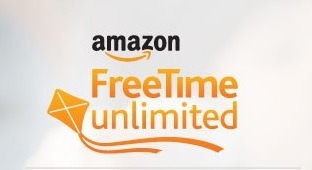 Freetime Unlimited works on Amazon tablets and iOS and Android devices. Families can also use their FreeTime Unlimited subscription to access FreeTime Unlimited on Alexa, an all-new Alexa experience for kids and parents with over 1,000 Audible kids’ books; kid-friendly, ad-free radio stations and playlists; character alarms; and premium Alexa skills from Disney, Nickelodeon, National Geographic, and more. FreeTime Unlimited on Alexa is available on compatible Echo devices, including Echo Dot Kids Edition, Echo, Echo Dot, and Echo Plus. Freetime Unlimited is a service for children from ages 3 to 12. Parents can customize their child’s experience, set time limits and even set bedtime for the device. Pricing begins at $2.99 per month for Prime members for a single child($4.99 for non-members). Family plans for up to four children are available and a 1-year pre-paid Family plan for Prime members is only $83 (non-members, $119). You can start a one month free trial here. Amazon recently added Spanish language content to the service and Spanish audiobooks are planned. Fintie Slimshell Case for All-new Kindle Paperwhite (10th Generation, 2018 Release) – Premium Lightweight PU Leather Cover – $9.99 to $17.99 – Available in Black, Denim Charcoal, Rose Gold, Galaxy, Jungle Night and Love Tree. OMOTON Kindle Paperwhite Case (10th Generation-2018), Smart Shell Cover with Auto Sleep Wake Feature for Kindle Paperwhite 10th Gen 2018 – $11.99 to $13.99. Available in Black, Blue, Purple, Brown, and Love Tree print. This case is PU ( artificial) leather. Infiland Kindle Paperwhite 2018 Case, Lightweight Shell Case Cover Compatible with All-new Amazon Kindle Paperwhite 10th Generation 6″ 2018 – $7.95 to $8.95 – Available in Black, Gray, Mint Green, Navy, Orange, Purple, and Royal Blue. Synthetic leather. ACcase Kindle Paperwhite Case 2018, ACdream The Thinnest and Lightest Leather Smart Cover Case for 2018 Kindle Paperwhite – $12.99 – Available in Black, Purple, Navy Blue, Red, Purple Glitter, Rose Gold, Rose Gold Glitter and Sky Blue This case is PU (artificial) leather, and, according to the description only fits 2018 Kindle Paperwhite, 10th Generation. Coopts Case for Kindle Paperwhite (10th Generation, 2018 Releases) – Ultra Slim Lightweight PU Leather Shell Cover with Auto Wake/Sleep Compatible Amazon Kindle Paperwhite 2018 Tablet – $14.99 – Available in a variety of colors and patterns. Synthetic leather. Fintie Folio Case for All-New Kindle Paperwhite (10th Generation, 2018 Release) – Book Style Premium Fabric Shockproof Cover – $15.99 – Available in Denim Charcoal (fabric) and Vintage Antique Bronze (synthetic leather). ACcase Kindle Paperwhite Case 2018, ACdream Folio Smart Cover Leather Case – $9.99 to $12.99 – Available in Black, Hot Pink, Purple, Purple Glitter, Rose Gold Glitter and Sky Blue. This case is PU (artificial) leather, and, according to the description, fits various models of Paperwhites. 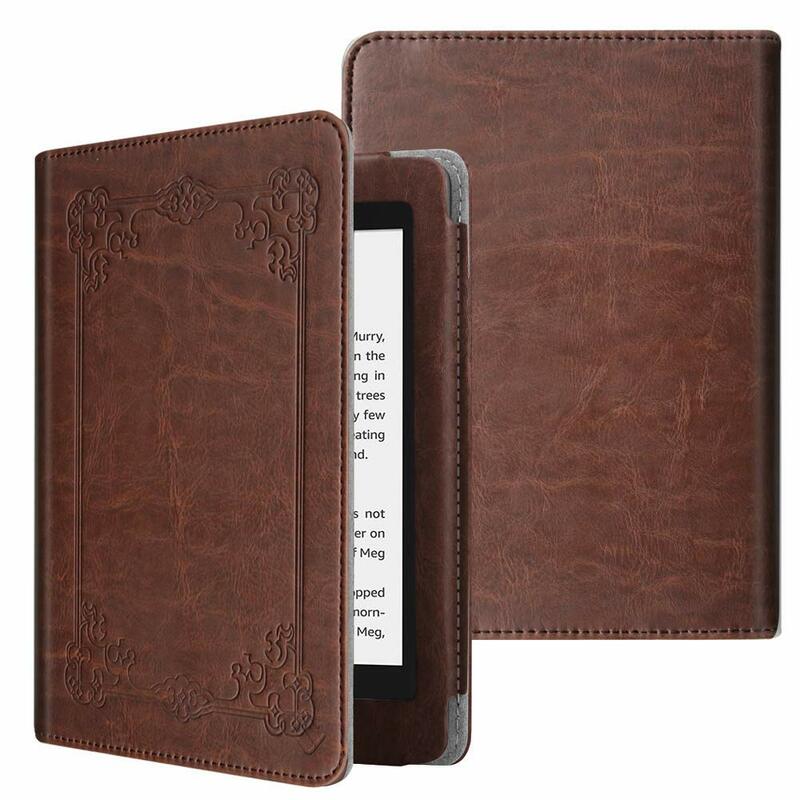 Ropada Case Kindle Paperwhite 2018 Released Kindle 10th Generation E-Reader 6” PU Leather Kindle Paperwhite Covers – $17.99 Available in Black, Blue and several other patterned designs. This case has elastic bands to hold ereader in place, so it will also fit other Kindle versions. Infiland Kindle Paperwhite 2018 Case, Multiple Angle Stand Case Cover Compatible with All-new Kindle Paperwhite 10th Generation 6″ 2018 Release – $9.95 – Available in Black, Gray, Mint Green, Navy, Purple, and Royal Blue. Synthetic leather. MoKo Case Fits Kindle Paperwhite (10th Generation, 2018 Releases), Premium Vertical Flip Cover with Auto Wake/Sleep Compatible for Amazon Kindle Paperwhite 2018 Tablet – $11.99 to $17.99 – Available in Black, Coffee, Indigo 1, Indigo 2, Purple, Red, Rose Gold, and Lucky Tree print. This case is PU (artificial) leather. TiMOVO Case for All-new Kindle Paperwhite (10th Generation, 2018 Release) – Slim Fit Vertical Multi-Viewing Flip Stand Cover with Auto Sleep / Wake for Amazon Kindle Paperwhite 2018 – $16.99 – Various colors, depending on availability. This case is PU (artificial) leather. Note that Amazon Prime shipping may not be available for all of these covers. Many covers start off shipping from their manufacturer and later become available directly through Amazon. The reviews for some of these covers are less than stellar. Due to Amazon’s confusing naming convention for their Kindles, it is unclear whether the poor fit reviews are due to buyer error or poor product design as there aren’t enough reviews for a true consensus. I recommend using caution when buying until there are more reviews. Harlequin has announces that they are changing ebook fulfillment providers in mid-November. 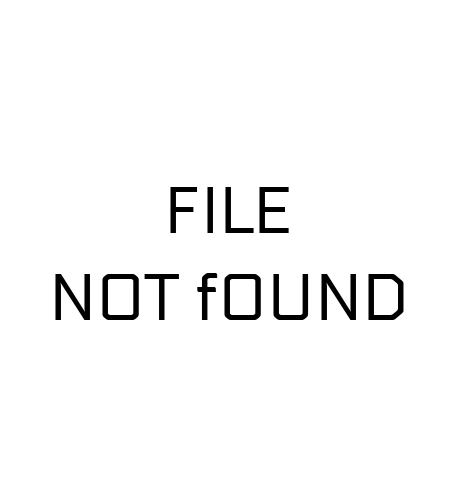 If you’ve purchased books directly from Harlequin Books in the past, you may need to act quickly in order to download your titles, especially if you have an older device or one that is not web enabled.It seems after the provider changeover, old titles will no longer be able to be side. Currently, you can continue to download your ebooks to the OverDrive app on your device or access them through the Read Now option as usual. Once the new ereading experience launches, you will be able to read your ebooks through your Mac or PC web browser, iPhone, iPad, Android OS smartphones and tablets, Nook HD+, as well as the Kindle Fire HD line of tablets. The free reading app can be downloaded from the Apple App Store or Google Play Stores respectively. *Requires Android 4.0.3 and above. *iOS 8.0 and above are only iOS versions supported. When the new ereading experience launches, you’ll be notified and provided with instructions on how to access your ebooks in the new app. This ONLY affects books purchased directly from Harlequin Books. Titles purchased through retailers like Amazon, Kobo, Barnes and Noble, Google Play, etc. are not affected. There are several interesting discussions on the topic on the MobileRead site that you can find here (starting at post #1662) and an entire thread dedicated to discussing the topic here. There is a lot of speculation about whether Harlequin is doing this as a cost-cutting measure and how this will play out as publishers are attempting to establish direct to consumer sales. Harlequin stopped providing audiobooks direct to its customers in October 2018. Halrlequin’s actions reinforce the concept that when you buy digital content, you do not own it. 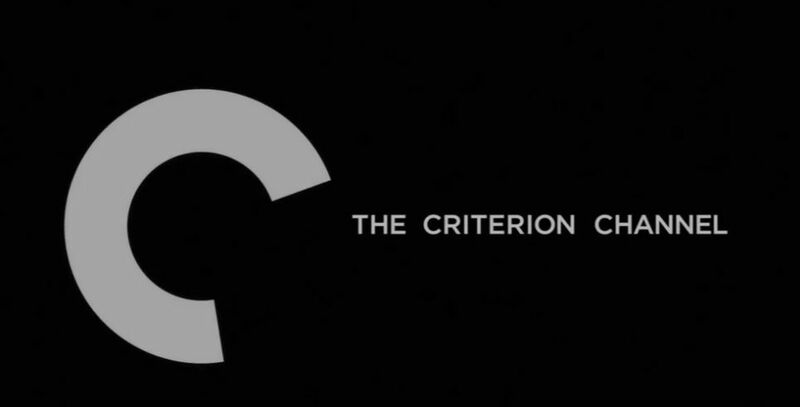 You are merely purchasing a license to use the content. 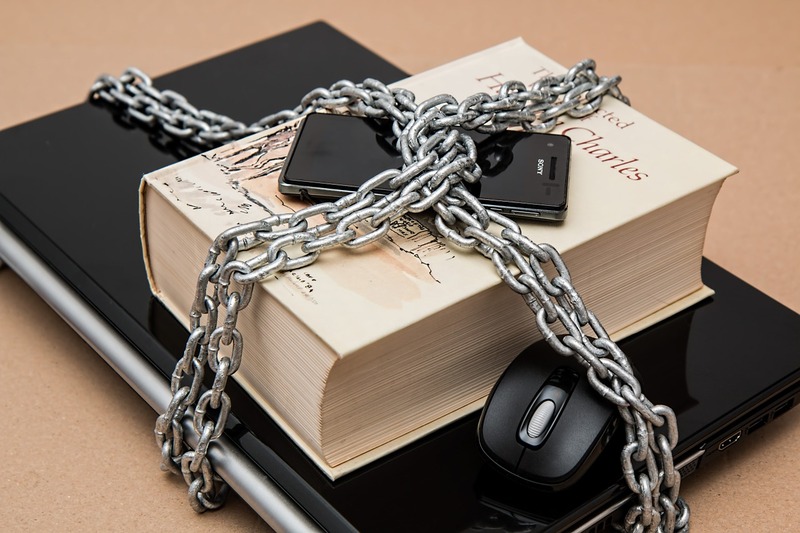 The publisher can take the content away or alter your ability to access it. It also really emphasizes the down side of buying books protected by DRM. Remember, you have until November 12, 2018 to download any purchased books! If you are a Amazon Prime Member, Amazon is offering a 90 day free trial for its Audible audiobook service. Normally, it is a 30 day trial period. Audible offers 1 audiobook and 2 Audible Originals each month for $15, and you can also find complimentary access to other audio shows and materials. I listen to audiobooks from the library via Overdrive and also listen to audiobooks as part of of my monthly Scribd subscription, I do miss the selection offered by Audible though (especially The Great Courses content) and have been considering re-upping my subscription. Please leave any thoughts in the comments!